As the dust barely has time to settle, if it can settle, from last night's announcement that Lane Kiffin is packing his dad up and going back west to Southern California, there is only one winner in this situation. And it is the same winner every time there is coaching upheaval in college football. That winner is Jimmy Sexton of Athletic Resource Management, because if you want to hire a coach or want to be hired as a coach, all paths seem to run through Sexton. All you have to do is run down his client list to see what some call a hammerlock on all of the Southeastern Conference coaching jobs, a list that is now expanding further into the Big 12 and PAC 10. This list includes, Lane Kiffin, Monte Kiffin, Houston Nutt, Nick Saban, Gene Chizik, Jimbo Fisher, Mike Gundy, Steve Spurrier, Tommy Tuberville, Will Muschamp, and the list goes on. How incestuous does it get? 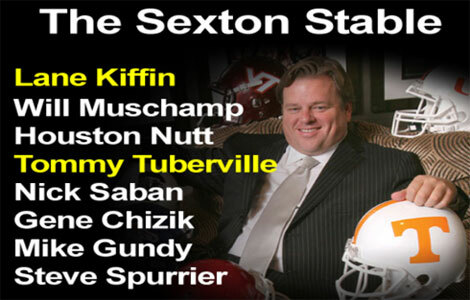 When Sexton client Phil Fulmer got fired by Tennessee, two of Sexton's clients (the Kiffins) got big contracts there. When Sexton client Houston Nutt left Arkansas, he was hired within hours by Ole Miss. The Coaching Gatekeeper: Jimmy Sexton's client list includes a who's who of college football coaches. Eye on Sports Media/2010. So who do you blame the wacky coaching carousel on? Is it the system, the expectations, or the agent? Is the agent operating out of greed or out of the best interests of his clients? If the agent has clients that are sticking it to schools like Tennessee, why do these same schools still turn to the agent to find a replacement? Is Sexton's market position really so dominant that they (and the coaches) have no choice?